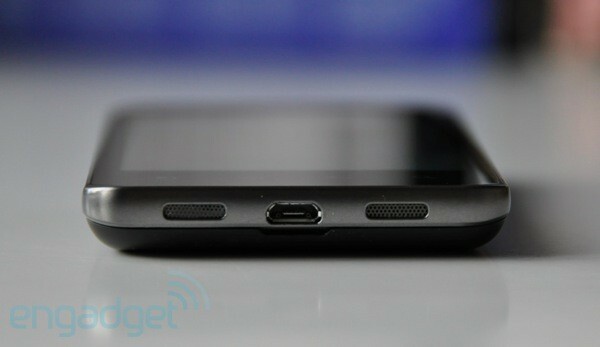 The world cried out for a dual-core smartphone and LG and NVIDIA answered the call. Actually, the world only ever dreamt about multicore mobile architectures up until late last year, but sometimes that's all it takes to get those zany engineers engineering. So here we are, in early February 2011, beholding the world's first smartphone built around a dual-core processor, the Optimus 2X. This is a landmark handset in more ways than one, however, as its presence on the market signals LG's first sincere foray into the Android high end. Although the company delivered two thoroughly competent devices for the platform with the Optimus S and T in 2010, they were the very definition of mid-range smartphones and the truth is that Samsung, HTC and Motorola were left to fight among themselves for the most demanding Android users' hard-earned rubles. So now that LG's joined their ranks, was the wait worth it? How would you rate the Optimus 2X? Nothing much has changed since we first met this phone under its codename of Star a couple of months back. 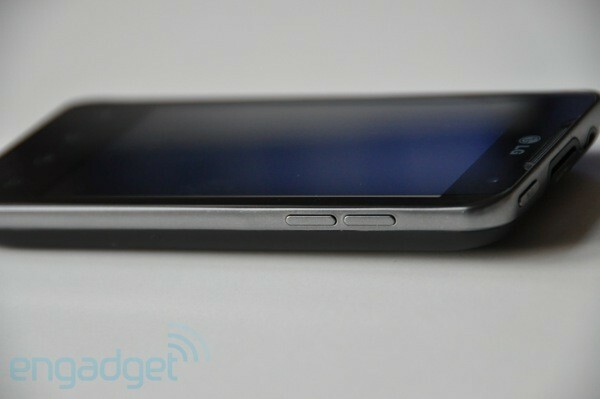 One uninterrupted slate of glass covers the entire front, broken up only by the earpiece grille at the very top. Four capacitive touch buttons keep the 4-inch WVGA LCD company, along with a front-facing camera just to the right of the LG logo. As we said in our preview, this is an uncomplicated and restrained design, evidence perhaps that LG chose to spend its time and money on what lies beneath the skin. The glass front slopes off on its left and right edges before being engulfed by a metallic frame that wraps around the whole handset. Fit and finish between the two is absolutely perfect. The third component to the 2X's external setup is a flexible matte plastic cover that accounts for its entire rear section. It's stupendously easy to remove and replace while still forming a very good seal with its surrounding elements. The austere black back (there'll be brown and white versions too) is decorated with a silver column running through the middle brandishing a "with Google" slogan, which ends in a slight bump near the top, designed to accommodate the 8 megapixel camera module. We're happy to see another little glass cover here protecting the lens from accidental damage. Overall, the Optimus 2X feels very well put together. It is rigid and unyielding, and although its construction materials are nothing special, the cumulative result is a highly pleasing one. Attention to detail is evident throughout, as even such simple things as the power / lock button and volume keys (the only physical controls on the 2X) feel perfectly measured and built. The screen does suffer from a bout of excessimus bezelitus and we'd have preferred non-capacitive Android buttons, however those are design decisions we'll just have to live with at this point. You'll find the bezel at least partially justified when you open up the rear and see how densely packed the 2X's internals are. 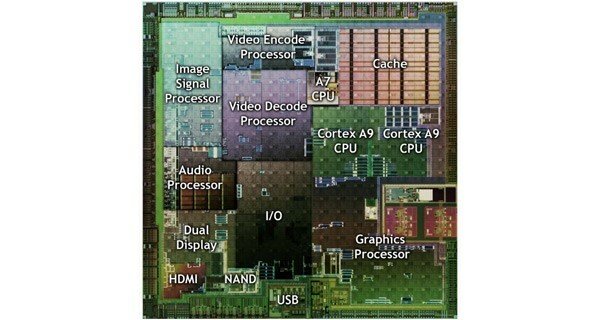 The star of that internal show is undoubtedly NVIDIA's Tegra 2 system-on-chip. It's highlighted by two 1GHz Cortex-A9 CPU cores and eight GeForce GPU cores, yet still finds the room to include native HDMI and dual display support. Pairing those two together means you can see content on your Optimus 2X and your nearest HDTV at the same time, though that capability isn't available when playing back video (only the bigger screen gets the moving picture feed). We still found plenty of use for the dual display functionality, particularly when browsing or showing off pictures on the handset, but it also helps tilt-controlled games like the preloaded Shrek Kart transform the 2X into a very slick-looking motion controller for big-screen gaming. It takes quite some graphical prowess to be able to execute this "HDMI mirroring" technique, particularly when displaying 3D games and not just stills, but the 2X does it without a sweat. That HDMI cable -- bundled in the box, as it should be -- is also put to good use with 1080p video content, which looks sharp and plays back flawlessly on the 2X. As we noted above, the mirroring capability is dropped when handling video, but that's unlikely to be an issue because we can't imagine a usage scenario where you'd need to see a video feed on both displays. Getting the HDMI connection up is a zero-setup affair and playback switches between devices on the fly -- disconnect your HDTV while watching a video and it flips over to the Optimus 2X and its integrated speaker; hook it back up again and within a second it's back booming at you from the HDTV. Just seamless. Scope out the video below for a demonstration of this phone's video-crunching credentials. Once you get past those well executed headline features, however, there's a certain scarcity of real utility to be had from this dual-core chip. The trouble is that smartphones haven't really lacked for processing firepower in a good long while. What applications do you run on your mobile that can choke a 1GHz CPU, whether it be a Snapdragon, Hummingbird or an A4? There aren't many, right? And there are even fewer that have such a demanding overhead while running in the background -- which happens to be NVIDIA's big selling point for Tegra 2, that it allows you to multitask without ever getting bogged down. 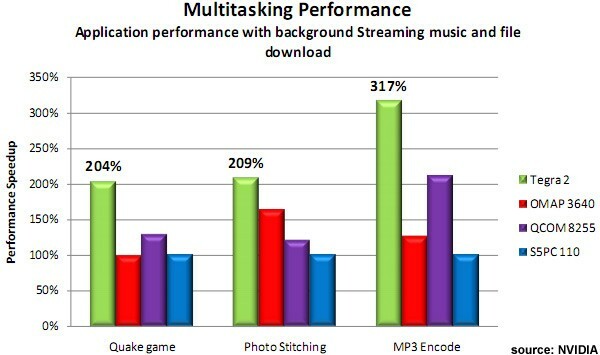 The chart below illustrates this well, but it also provides your absolute best case scenario -- you'll need to be engaged in a CPU-intensive process while decoding music in the background, another CPU job, and downloading / installing applications. As soon as you back off, say by switching off the background music and allowing your foreground process to have all the processing power (and thereby complete its task more quickly), the benefits of having a dual-core machine will become far less tangible. The conclusion therefore is that, yes, multitasking maniacs will find their mobile lives accelerated by having that second core, but the rest of the world might very well shrug its shoulders and ask "is that it?" Like a city dweller owning a supercar, the Tegra 2 buyer will have to be wary of the fact that his hardware will far exceed his daily needs and will only show its true, brilliant colors on rare occasions and under just the right circumstances. A 4-inch WVGA (800 x 480) LCD might sound like standard fare for modern Android phones, but LG's panel is a notch above the average. It's bright and well saturated, retaining its color fidelity even at oblique viewing angles. We wouldn't say it's competition to the IPS displays available on Apple's iPhone 4 or Sharp's IS03, but then again, not many are. In the absence of such advanced display tech or Samsung's snazzy Super AMOLED, we reckon LG has given us the next best thing with the 2X's screen. Update: As it turns out, LG's 4-inch LCD on the 2X is actually an IPS panel! That would be the reason it looked better than the run of the mill LCD, however we'd still caution against expecting iPhone-level quality. It isn't up to the same standard. All that said, our testing unit had a manufacturing defect that exposed some backlight bleeding at the very top (see image below). We don't expect retail units to suffer from the same flaw, so we'll let this one slide unless and until we hear of the issue showing up in other handsets. 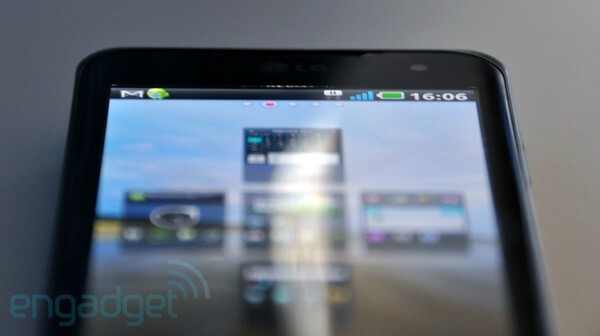 One thing we touched on in our Optimus 7 review was LG's preference for less sensitive capacitive touchscreens than the competition. It was a commendable choice on the Optimus 7, helping us minimize unintended inputs, however we found the experience on the Optimus 2X rather less satisfying. Far too often our gentle swipes failed to move the stoic homescreen from its position and we had to apply that extra bit more pressure to get it to register. Adapting to this peculiarity is probably just a question of habit, but it's still something to bear in mind. Spanning a full eight megapixels, LG's camera sensor can surely get you all the dots you need, but what is it going to fill them up with? A great amount of detail, as it turns out. 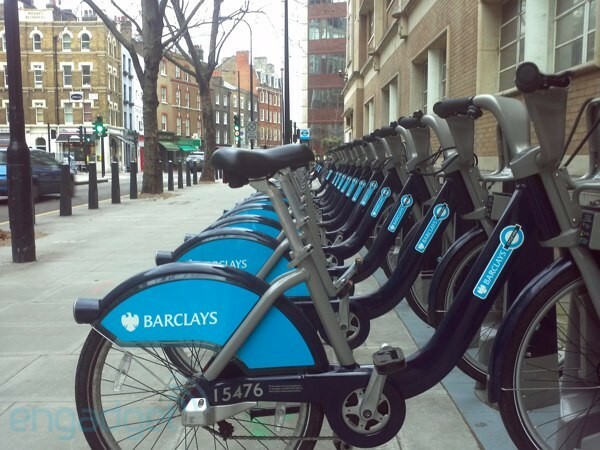 In the full-sized image of the bike rack above, we can read the small print next to the bike's code number without difficulty, while noise is kept in check admirably well. In fact, you're more likely to decry the noise-reducing blur, which is sprinkled in judiciously, than any signs of excessive graininess. The integrated LED flash is very bright, to the point of washing out any subjects that get too close (a habit the 2X has obviously picked up from its family mate, the Optimus 7), though we reckon that'll be well appreciated by all the nightclub amateur photogs. Overall, the Optimus 2X packs a very impressive little camera, particularly when you consider it essentially comes as a free extra on something you're keeping in your pocket anyway, and its full suite of adjustment options adds to those credentials. We enjoyed having exposure compensation as an easily accessible option, while playing around with the negative image effect, which does what its name suggests, was also a good deal of fun. We do have a couple of dissatisfactions to express, however. The first is that colors look a little washed out. London can be a dreary place at this time of the year, but the Optimus 2X made it look that extra bit bleaker than it really was. This isn't a massive issue as there's a litany of color adjustment programs out there (plus the phone offers a vivid mode of its own) and we'd sacrifice some saturation for all the extra detail quite happily. The second thing that ailed us was that the camera app takes a little while to process each image before being ready for the next, yet leaves you without a visual clue to the fact it's still working. Consequently, users bashing the "New" button to start composing a new image are left frustrated and a little confused as to why the phone isn't responding to their input. The front-facing 1.3 megapixel camera should be thought of strictly as a video calling facilitator. Chromatic noise sneaks in almost as soon as you step out of perfect lighting and the pictures you take with it won't be of use for too many purposes. As to video on the Optimus 2X, it can be recorded at resolutions up to 1080p -- we saw no obvious processing lag or frame rate stutters at all -- and does a good job of emulating the camera's stills performance by capturing plenty of visual and aural detail. Check out the video below for an idea of what to expect, it was shot using the Super fine quality setting. The loudspeaker on the Optimus 2X is a direct imitation of Apple's iPhone arrangement -- it sits behind the right grille you see above and does a very decent job. Sound output is hard to muffle too, as some of it escapes through the back of the phone, a handy little imperfection to its design. The earpiece is also up to par, with call quality being no better or worse than the competition. The 2X does warm up during extended calls, but again, we can't think of any comparable phones that don't. Battery life was an important aspect for us with this phone, for obvious reasons. Our happy discovery was that the Optimus 2X can keep up with the current crop of Android multimedia powerhouses, perhaps even outlasting some of the less frugal among them (Desire HD, we're thinking of you). This is mostly down to Tegra 2 having a minimal power draw when idling. We managed to cross the 24-hour standby mark on a day when we did about an hour's worth of calls, a few minutes of HD video, and some sporadic music playback, all while keeping push email notifications and the 3G and WiFi radios constantly on. Note that for the majority of that time the screen was turned off and the processor didn't really have much work to do, but the experience illustrates that you can take a dual-core smartphone on the move, provided you don't expect anything more from it than you would from its single-core brethren. The camera turned out to be the biggest battery drainer, with 1080p decoding and encoding following up in close second, both predictable outcomes. We can't conclusively say whether the Optimus 2X is more or less power-efficient than its contemporaries -- efficiency being a function of both power consumption under load and the duration of load times, the latter being shorter on a faster chip -- but we didn't feel any more restricted by its longevity than we did when using the likes of the Galaxy S, Desire HD or Droid X, its direct competitors in the Android big leagues. 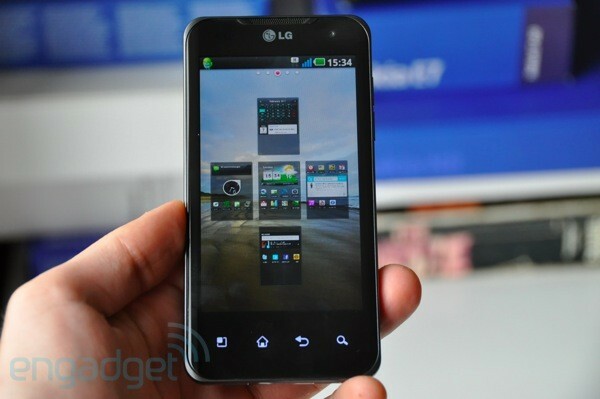 Not to put too fine a point on this, LG, but why does your dual-core beastphone feel like an 18-month old HTC Hero? The final code simply doesn't look to have been optimized as well as it should have been -- a suspicion corroborated by our unfortunate knack for finding ways to crash applications. Reading the spec sheet, you'd expect lag on the Optimus 2X to be measured in flaps of a hummingbird's wings, but the mildly tweaked Android homescreens plod along in a fashion that's appreciably worse than what you'd get on the real Hummingbird devices, Samsung's Galaxy S variants. UI responsiveness on the 2X can be described as mediocre, which we find a mind-boggling development as the hardware is certainly fast enough. It's important to note that applications load up as fast or faster than most other Android handsets we've come across, it's just that navigating to them and through the 2X's menus didn't feel as snappy as we would have liked. The final code simply doesn't look to have been optimized as well as it should have been -- a suspicion corroborated by our unfortunate knack for finding ways to crash applications. For example, our review unit's Gallery app crashes each and every time we exit it via the Back button after entering it through the Clock application. We found that bug without even looking for it, never a good sign. Worse yet, the 2X's relatively unresponsive behavior isn't exactly sparing system resources. 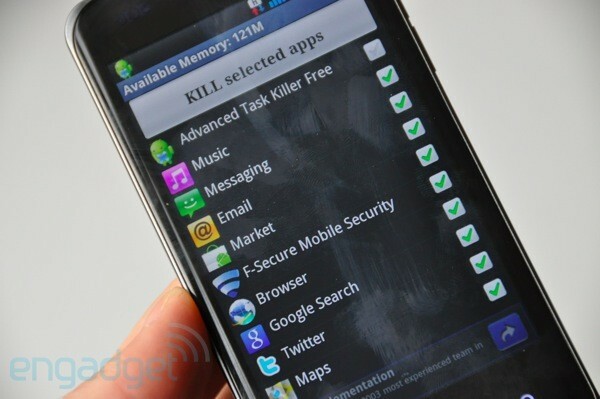 We installed Advanced Task Killer (which we also managed to crash, woohoo!) on the 2X and even after clearing out all the apps running in the background, the highest amount of memory we could free up was 210MB. That means that of the device's 512MB of available RAM, a good 300MB are taken up by the OS itself. That's a hefty footprint to have when you consider that 256MB of RAM was the standard among smartphones until not too long ago. One of the culprits for this lack of frugality is the Music app, which is impossible to shut down because its controls are integrated into Android's window-shade slide-down menu. That integration in itself isn't actually the worst idea in the world -- and neither are the rest of LG's moderate modifications to the Android interface. Contact pages are spruced up in a well organized and logical manner, the messaging application has a delightful little drop-down preview of your latest unread text, and the calendar and weather / clock widgets are also nice extras to have. There's a boilerplate social networking updater, which can send your status out to Twitter, Facebook and Myspace at the same time. That part's good, the Twitter for LG and Facebook for LG apps are not. The Optimus 2X's saving grace is the same as that of many a Motoblur handset: LauncherPro. Anyone familiar with the remedial effects of installing this little Android skin on their phone will know that a laggy default UI is just something you look at for the 30 or so seconds it takes you to open up the Market and download Federico Carnales' masterwork. Any qualms we have about the Optimus 2X's smoothness evaporate into thin air with LauncherPro in effect, and we even noticed the phone's unlocking animation -- whose appearance remains unchanged -- felt snappier. LauncherPro patches over, but it doesn't fully heal LG's gaping software wound. We still managed to clunk applications into dysfunction, which was an unfortunate reminder of what lies under the skin. LG's evident weakness on the software front shouldn't be overstated in terms of its impact today -- app glitches were sporadic rather than regular -- but it's a major sticking point if you're hoping the company will deliver a competent Gingerbread for the 2X. After all, Froyo has been around for over half a year, yet the best thing we can say about LG's treatment of the OS is that "it doesn't crash too often." Would you really bet your mobile updating future on a track record like that? The recurring theme through our hardware testing was that Tegra 2's full potential has yet to be tapped. NVIDIA is working hard on correcting that and has enrolled the makers of the Unreal Engine into its development program to ensure that upcoming graphically intensive games make full use of the extra power its new hardware offers. The Tegra Zone, a preloaded app on all Tegra 2 devices, will be central to this effort. It'll present NVIDIA-curated games, videos, trailers, and app recommendations that showcase its chip's superiority. Devs are being encouraged to create graphically fancier versions of their games specifically for Tegra 2 -- as the makers of Galaxy on Fire 2, Dungeon Defenders and Samurai 2 have already done -- with a presence in the Zone serving as their reward. You might call it fragmentation, but NVIDIA would call it just good business. Update: LG has gotten in touch to say the Tegra Zone app was left on our review handset by accident and won't ship with devices. NVIDIA is still in the process of testing its application out and you'll likely have to download it from the Android Market if you want it on your retail 2X. On the other hand, NVIDIA itself has promised to preload the Zone on phones and tablets running its silicon, we're just guessing it'll do so once said testing has been concluded. Either way, NVIDIA's clout with developers and considerable budget look likely to secure Tegra 2 a bright and increasingly useful future. In the short term, however, this powerful new chip's biggest contributions to the smartphone realm are going to be 1080p video recording and output plus a dash of added gaming oomph. We started off by talking about LG's failure to make itself known among the Android elite to this point. Up till now, the Korean giant has never so much as hinted at threatening the incumbents atop the Android pile, and the 2X is therefore its most significant smartphone launch, well... ever. It carries the hopes and aspirations of an entire multinational corporation, and if you want any evidence of how important mobile hardware is becoming, just go check out LG's latest quarterly and annual fiscal results. This phone matters. And it should matter to us just as much as it does to LG, because everyone benefits from having another legit big-timer competing at the high end. Then maybe we won't have to sit through umpteen different variations on the Galaxy S formula from Samsung or HTC's exhibition of "13 ways to repackage a Desire HD." The good news for LG is that it's built a very solid foundation for itself with the Optimus 2X -- Tegra 2 is an undeniably powerful, multicore architecture, one that's only going to expand in importance and value as we move forward, and the rest of the phone's specs all match up to our basic expectations of a top tier handset. Construction is robust, finely detailed and generally unobtrusive. The screen may not have anything Super about it, but as LCDs go, it's a very good one. Where we were left disappointed, however, was in the company's software execution. Neat little tweaks to Android's default interface failed to obscure the fact that the Optimus 2X is neither as responsive nor as stable as it should be. You might be able to rectify those flaws by installing one of the inevitable avalanche of custom ROMs that this device will benefit from, but we're here to review LG's own performance and we find the failure to deliver a reliable platform inexcusable. The Optimus 2X offers great, benchmark-elevating hardware, but can't earn our seal of approval until it gets its software kinks straightened out. As it stands today, it's a great toy for developers and enthusiasts that offers the rest of us a tantalizing glimpse at what the likes of the Atrix 4G and Galaxy S2 might bring as the smartphone world continues its move toward multicore devices.